Whether you are eligible to file under a particular chapter of the bankruptcy code is dependent upon a number of factors. One of the most critical factors is whether or not you qualify based on income. Income is calculated based upon all sources for one part of the bankruptcy petition, yet not necessarily included in the means test. Because income is such a critical factor in qualifying for either chapter 7 or Chapter 13, prospective clients must be able to provide proof of such income. This proof can be in the way of a paycheck stub, Social Security benefits statement, unemployment benefits statement, a bank account showing deposits of other sources of income or any other proof which can be provided to either a Chapter 7 or Chapter 13 trustee that justifies the filing under that particular chapter. For many prospective clients and existing clients, coming up with the proof of the income is burdensome. Not everyone receives a physical paycheck stub each time they are paid. Some people have online access to their last 60 days of paycheck stubs while others do not. In either event, as a bankruptcy attorney preparing the case for filing, my office must have verification to do our job properly. The bankruptcy code and the court has put a burden of due diligence with regard to verification of a debtor’s income. It is not enough to simply rely on the fact that the debtor states they make $400 per week without actually seeing some proof thereof. At times, debtors are reluctant to provide what is needed under the bankruptcy code. When I first meet with a prospective client, I advise that client to continue to save their pay advices. I state this because when the client decides to file, they are going to need to provide the most recent two months’ worth of paycheck stubs just before the filing date. If the debtor is continuing to collect the stubs, it makes that requirement of the bankruptcy code very simple to satisfy. The need to provide proof of income is especially true with regard to chapter 13. Chapter 13 is a reorganization of either some or all of a debtor’s debt. The amount that the debtor pays to the Chapter 13 trustee each month is dependent upon a number of factors. One of those factors is disposable income. Disposable income is essentially what is available per month out of the debtor’s budget which can be allocated towards the chapter 13 payment plan. The Chapter 13 trustee is going to scrutinize and analyze those paycheck stubs to make sure that the information on the stub correlates to the information on the bankruptcy petition. The trustee’s duty, among others, is to make certain that the debtor is providing all of his or her disposable income towards the chapter 13 plan. Without a stub in hand, the trustee cannot perform his duty. Thus, without adequate paycheck stubs prior to the actual meeting with the trustee, the trustee will not hear the meeting. If proof of income is not provided thereafter, the trustee will bring a motion to dismiss the case for failure to comply with the bankruptcy code. 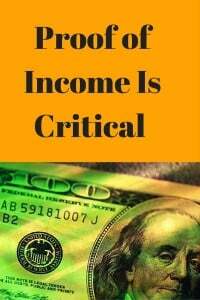 In summary, proof of income is a critical factor when dealing with bankruptcy. It is mandated by the code, it is necessary for the debtor’s attorney to do his job and the trustees are going to require the production of such proof. Instead of risking the case being dismissed for failure to comply with the code, it is much better if the debtor can get proof of income to their attorney in a timely manner. The attorney wants to make sure that he is providing accurate information for you to sign your petition. The attorney is also wishing to determine which chapter of the bankruptcy code you qualify for. So please heed your attorney’s advice and provide that proof of income as soon as possible. Why risk having your case dismissed after you’ve gone through all the trouble and effort to actually file your case. The better option is to have your case be successful. You have a greater chance of success if you can provide proof of your income to your attorney immediately upon request.